Who else loves oatmeal raisin cookies! 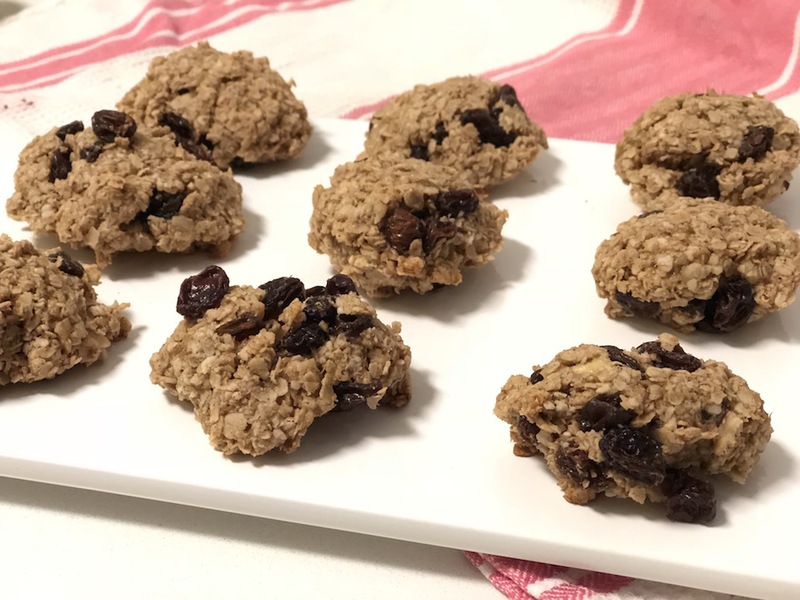 This recipe has all the flavor I crave, but without all the added sugar found in conventional oatmeal raisin cookies. Instead of sugar, I used Monk Fruit extract, which is a natural sweetener 300–400 times the sweetness of cane sugar but with no calories and no effect on blood sugar. My version is vegan friendly and gluten free, while still being chewy and delicious. When it comes to staying healthy there is no need to sacrifice flavor when watching your sugar. I hope you enjoy this sweet treat! In a large mixing bowl, mix together the dry ingredients (oats, monk fruit extract, cinnamon, salt). Next add all the wet ingredients to the mixing bowl (melted nut butters and coconut oil, mashed banana, vanilla extract if you want it), and mash/mix together with a fork or spoon until well mixed. Next fold in the raisins. Form the cookies into 1-2″ balls (depending on how big you like them), and place onto lightly oiled baking sheet (I use coconut oil). Place the baking sheet into the oven and bake for 10-15 minutes or until slightly golden brown. Get more healthy sweet treats here!